HRH Crown Prince Hussein of Jordan. HRH Crown Prince Hussein on Monday took part in the final touches to the first Jordanian miniature satellite (JY1-SAT) project, a Royal Court statement said. The JY1- SAT was designed and built by young engineering students in Jordanian universities under the supervision of the Crown Prince Foundation (CPF). His Highness, who made a visit to the Nanotechnology Institute, participated in the installation of the last piece of the mini satellite, which comes within CPF’s "Masar" initiative aimed to guide young people toward space science and related research, and provide training and research opportunities in the field of satellite engineering and design of space missions. Jordan's first satellite, the JY1-SAT. The satellite is scheduled to be launched in the first quarter of next year and is designed to achieve educational research objectives in the first place. The satellite is also aimed to promote the Kingdom to tourists by broadcasting images of touristic and heritage sites, and communicate wirelessly with Earth stations around the world. The Crown Prince recorded an audio message at the Nanotechnology Institute, which will be later uploaded to the satellite's memory and broadcast in space, to be available for reception by all terrestrial receivers in the world. The satellite carries the name JY1-SAT to commemorate His Majesty the Late King Hussein, for his radio call was JY1. His Highness listened to a presentation by Masar initiative organizer Sanad Haddad who said that the plan was proposed by Jordanian students who participated in the first batch of the cooperation program with NASA. 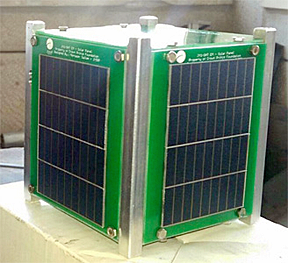 The interns had suggested the design and launch of the first Jordanian satellite cubesat. Haddad said that the smallsat is the first Jordanian experience in the space world and the only Arab mini-satellite that was designed and built locally by 19 students, academics and consultants from various engineering fields in Jordanian universities. For his part, President of The Jordan University of Science and Technology (JUST), Omar Jarrah, briefed the Prince on the university’s achievements on the global and local scales.